by Byron Bixler Many times have we seen the story of the old, curmudgeonly man forced by circumstance into close quarters with an eccentric kid, the pair not liking each other at first, but eventually forming a heartfelt bond. However, it has rarely been told with such intelligence and infectious energy as it is in Hunt for the Wilderpeople. The film begins by introducing us to Ricky Baker (Julian Dennison), a chubby 13-year-old aspiring gangster who is sent by child welfare services to live in the country with an upbeat new foster mother (Rima Te Wiata) and her prickly husband, Uncle Hec (Sam Neill). Despite being received with great warmth, Ricky is none too thrilled about his new surroundings and initially attempts an escape. But his plans quickly fall through when he realizes that he doesn’t have the stamina to hike hundreds of miles through the New Zealand bush. However, after a misunderstanding and a series of events that I’d rather not spoil, Ricky and Uncle Hec end up having to traverse that vast wilderness. With Ricky’s dog, Tupac (yes, as in the legendary rapper, 2Pac) in tow, the duo goes on the run from the law, encountering a handful of strange characters and gradually growing closer in the process. Hunt for the Wilderpeople is a coming-of-age tale with a perfectly judged sense of pace and tone. This cannot be stressed enough. The downfall of so many films of this kind tends to lie in how they balance humor and whimsy with more emotional material. It takes a steady hand to make such a story funny (but not intrusively or forcefully so), and moving (but not treacly or overcooked). Somehow director Taika Waititi (What We Do in the Shadows, Eagle vs. Shark) pulls this off, evading the many traps that could have rendered his film just another sentimental, “cute” flick worth checking out and then quickly forgetting. Wes Anderson comparisons have been all over the place for this movie and they’re hard to deny, as Wilderpeople‘s closest cinematic relative is probably Moonrise Kingdom. The resemblance is noticeable in the vibrant, quirky and sardonic personalities that populate the film as well as in the “storybook-like” presentation and the screenplay’s quick wit. However, it’s important to specify that the overall vision and execution feels refreshing. For one thing, the movie is uniquely New Zealand, serving as a beautiful and passionate showcase of the country and all it has to offer. Like Wes Anderson, Waititi sets his film in a slightly softened reality, but unlike Anderson (at least as I see it), he is able to better establish the humanity of his characters by not holding back on certain tough truths of life. It’s not all shtick and goofball whimsy. Unexpected deaths happen and those left behind have to cope with them. Characters, for as silly as they can sometimes be, reveal evidence of vulnerability in small flashes. Even the designated “villain,” an overdetermined child protective services agent (Rachel House) who is on the titular “hunt” for our two accidental fugitives is made real with one very small line spoken to her near the end. In an instant, we understand where the blowhard attitude comes from and what she really aspires to be. We see that all-important chink in the tough façade. The minor supporting characters are largely drawn as humorous window dressing, but when it comes to the principals, their rough caricature-like outlines are filled in by the angst and hurt of real human problems. The methods of drawing such emotion out are hard to describe — you kind of just have to see it. Waititi does that incredible thing that some directors do where he can literally have you busting a gut at a hilarious line just before introducing something sad or emotionally intense…right before easing you back out of those emotions with another laugh. And amazingly, it’s entirely seamless. The juxtapositions are never jarring and the switching of tones never feels like the movie is awkwardly jerking you around — the progression makes sense. The sensation is not like that of a roller coaster, but by the end, you certainly feel like you’ve been on a complex ride of highs and lows. Cartoony elements mesh with more grounded qualities to create something ultimately quite genuine and sweet. Hunt for the Wilderpeople is bursting with heart, but its lessons and earnestness doesn’t ever bring the momentum to a full stop. Sentimental scenes and meaningful moments get to the point in ways that are clever, fitting and succinct, allowing just enough time for things to set in and not overstaying their welcome. The story is always in motion, but not to such a degree that we get more caught up in the chase and plot details than in the underlying souls of our protagonists. 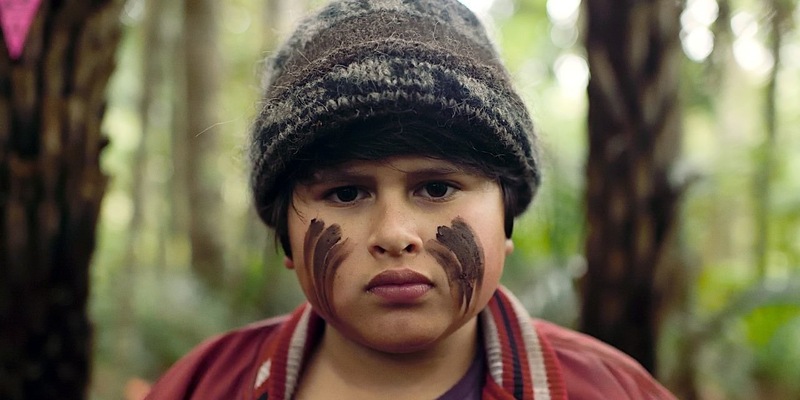 Led by an endearing performance from relative newcomer, Julian Dennison and thoroughly charming in its good-natured spirit, Hunt for the Wilderpeople is damn near impossible to hate — a surefire contender for “movie of the summer” that will almost certainly end up being one of the best films of 2016. Hi Filmic Magazine — Thought you might like to know Hunt for the Wilderpeople is playing at Cornell Cinema next week – Thu Oct 6th, Fri Oct 7th, and Sat Oct 8th. cinema.cornell.edu for more info.